The practically motivated epistemology that sets for itself the goal of establishing those things that would be a prerequisite to the "success" of the first science, namely metaphysics, is itself, in Hegel's estimation, indebted to a presupposed understanding of knowledge as "an instrument, and as a medium" --hence the need to learn how to direct it which this proposed epistemology would satisfy. But the instrumental function of knowledge is indebted to a much older thinking which, perhaps ironically, has no place for epistemology. This older thinking is the thinking of that ancient founder of Logic, Aristotle. 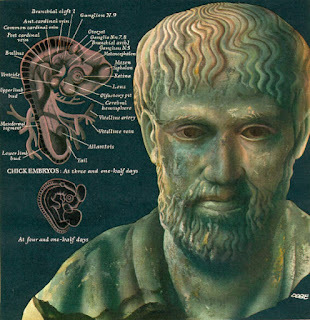 That consideration capable of considering knowledge apart from its objects, and thereby capable of directing scientific pursuit as a propadeutic to the latter which could ensure its correctness, is to be found in those books which Aristotle called the Organon, the instrument. But what of this understanding of logic as a propadeutic, as an art, and as the directions for right reasoning? How does it fare against Hegel's critique? Does his critique not penetrate even beyond Kant and into his greatest intellectual fore-father(s)? I rarely assert anything except as fodder for dialectic. Having discovered that I cannot teach philosophy, I now have no reason to speak about it unless I think I can learn. And I now would learn from you how you can withhold suspicion of a science which notoriously produces contradictory results. Let us say that a metaphysician has claimed that the forms of things are separate from the things. (This need not be Plato. But someone at least seems to have thought so, or Aristotle would have had no one to argue against.) Then why should we not listen to him rather than Aristotle? How are we to decide? What is acceptable as a premise for an argument about the separateness of forms? Or should we not refer to arguments at all? Or on the other hand is it possible to avoid any question of what we "should" do about the separateness of forms? All that is to say, if two men practicing metaphysics in good faith assert (as they do) contradictory things about being, or substance, or form, or what you will, do we not need some way of negotiating this contradiction (either by deciding against one or the other or both assertions or by finding some way to reconcile them by way of a distinction, or perhaps by some other dialectical process still beyond my comprehension)? What is epistemology but the pursuit of such a method? So that without epistemology, is not any response to such a contradiction just a shot in the dark? Good to see you over this neck of the woods, F. Thanks for following along as I sloppily hash out a few half-formed thoughts. "I rarely assert anything except as fodder for dialectic. Having discovered that I cannot teach philosophy, I now have no reason to speak about it unless I think I can learn. And I now would learn from you how you can withhold suspicion of a science which notoriously produces contradictory results." Really? I find myself asserting things without intentions of dialectic all the time! How, for example, are you still married? Or is your assertion that you "rarely assert anything except as fodder for dialectic" NOT one of those rare instances that it itself mentions? If so and it indeed is not, Cretan, your lies may just presuppose a truth beyond the reach of dialectical method alone. "And I now would learn from you how you can withhold suspicion of a science which notoriously produces contradictory results." That's fine but I am afraid your questions are already too sophisticated for me! After all, I don't know whether science, properly understood, ever produces results, nevermind contradictory ones --and this is especially so for that science which would (aspire to?) be most properly so called. I have advocated for Kant before on this blog (and over at the one linked to above) but always transparently --I mean, let me just baldly assert (tho I would be happy to enterain dialectic regarding it), Kant is old hat for a phenomenology that has attained a genuine relation to its own starting point ---i.e. has become truly phenomenological. On the other hand, Kant becomes quite different and new on the way to precisely this attainment (via Destruktion). But I think even a lesser phenomenology can dispatch with Kant's concerns about the contradictory results of metaphysics... that's why I leaned on Hegel (after you mentioned you wanted to write "something to do" with him). "...if two men practicing metaphysics in good faith assert (as they do) contradictory things about being, or substance, or form, or what you will, do we not need some way of negotiating this contradiction (either by deciding against one or the other or both assertions or by finding some way to reconcile them by way of a distinction, or perhaps by some other dialectical process still beyond my comprehension)? The title of this blog is "Seynsgeschichte." The motto is "Eadem mutata Resurgo. "Two men truly thinking think after the Same. What this probably cryptic sounding statement is supposed to introduce in our discussion now may be understood in the following manner (which I indicated in my first paragraph in this comment), namely that these supposedly contradictory assertions (between metaphysicisans of 'good faith') are not contradictory if they are kept within the unique element in which they have arisen. This element is the element which we think --it is as Heidegger refers to it in his Letter on Humanism, the "quiet power of the possible." The important word here is "possible". Allow my dialectical contention to be this (also stated in language that is "old hat"): Because of the unique modality of factical life, that science which properly seizes upon the possibility of that life achieves a unique modality, namely that it can be actually present as a possibility --namely as the possibility of its own founding. Metaphysics in its foundations never simply gets "put forth" and metaphysical counterclaims to those foundations also exceed this sort of presentation; each time metaphysics is actually done it also includes an inherent possibility --not in addition to its actual 'answers', but as constitutive of them in their very actuality. The same goes for this my 'dialectical' claim. "What is epistemology but the pursuit of such a method? So that without epistemology, is not any response to such a contradiction just a shot in the dark?" Epistemology is more than methodology and it surely requires its own. Why or whether a methodology (be it under the guise of epistemology or of logic) can be established is a question I hope to address while writing this series of posts. But I think Hegel already flattens this naive request for epistemology as preventative measure against metaphysical contradiction. I think I could follow you better if you could explain the "unique element" of thoughtful metaphysical assertions in terms of an example. How (for instance) do we determine whether Aristotle is "truly thinking" when he says that forms are not separate? What is the "same" that both he and the object of his criticism are thinking after? What is the "inherent possibility" which constitutes the actuality of the claim that forms are not separate? In what element can we listen both to the claim that forms are separate and the claim that they are not without losing touch with any meaning either claim might have? BTW, did my comment on Part 2 get through? To continue with the second reason --Hegel does not consider even the abstract-est skepticism to be just that; skepticism, like the Critical call for a preliminary epistemology, is a response. It presupposes a precursor and is situated in a sequence. What's more it is a NEGATIVE response. It is antithetically posed toward an original, naive position. It is at once a mediate position, and it is focused on that which mediates, namely knowledge qua medium between knower and reality. Because it is negative and mediate, it betrays itself as a moment within a larger position, namely the negation of its negation (which Hegel himself is already alluding to in the quote under discussion). Because the inner movement of history is, for Hegel, precisely dialectical, the most abstract skepticism is already concretely historical and arises from an "actual" set of problems in the history of thought. "I don't see that Hegel's critique of abstract skepticism bears on the question of what to do when confronted with actual metaphysical contradiction, especially if the confrontation is open to the possibility that a more comprehensive position may be found or a distinction may be made in terms of which the contradictory claims may be resolved into a unity." The point I would argue is that, in the context of his Phenomenology, Hegel's critique of abstract skepticism is precisely INSISTENT on "the possibility [nay, the necessity] that a more comprehensive position may be found or a distinction may be made in terms of which the contradictory claims may be resolved into a unity." Abstract skepticism is a necessary Moment of its own overcoming.